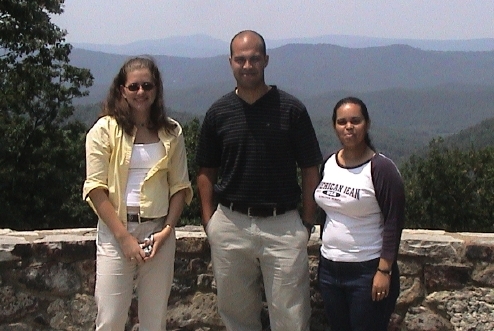 Radio JOVE Will Participate in "100 Hours of Astronomy"
In July of 1997 a Jove Program development meeting was held in the ham club building at Goddard Space Flight Center (GSFC). The meeting was like old home week for Jim Thieman, Ron Parise, Michael Desch, Leonard Garcia, and Richard Flagg, all formerly associated with the Jupiter radio research program at the University of Florida. At that time the Jove program was an unfunded idea - there was no hardware or software. Many issues were discussed including what frequencies to use and how much a kit might cost. We decided to develop software to allow plotting signal strength on a computer - a radical departure from the ink spewing strip chart recorders in use at the UF Radio Observatory (UFRO). A $100 cap on the cost for the receiver and antenna was set as a goal. 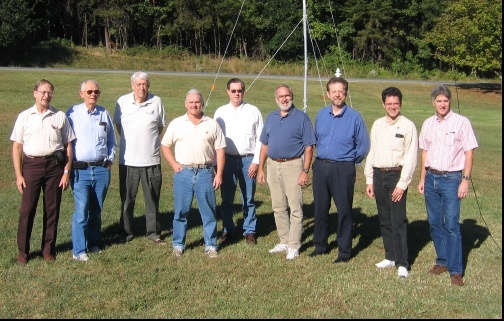 Some of Radio JOVE's core team members are (from left to right): Jim Thieman, Wes Greenman, Richard Flagg, Jim Sky, Jim Gass, Bill Pine, Jim Green, Leonard Garcia, and Chuck Higgins. A link was established with Bill Taylor and Bill Pine of the INSPIRE program. This highly successful NASA-affiliated VLF radio program provided the infrastructure for early Jove kit ordering and distribution. Our close relationship with INSPIRE continues under the leadership of Kathleen Franzen. Over the next several months the receiver design evolved - moving from a traditional superheterodyne architecture to a simple direct conversion receiver. While receiver development was underway in a cramped corner of Flagg's apartment living room in Honolulu, Francisco Reyes, Tom Carr and Wes Greenman developed the antenna in Florida. Ron Parise burned the midnight oil in Silver Spring, Maryland, developing JoveChart. Simultaneously Jim Thieman secured funding for the project as part of the Director's Discretionary Fund at GSFC. By the following Spring the hardware and software came together in a beta version of the Jove kit, and in July we converged on the annual SARA meeting in Green Bank, West Virginia. Late one cold and foggy night, after connecting the new Jove receiver to the historic Jansky radio telescope antenna, we were rewarded with our first Jupiter signals. One participant in that nights festivities was Jim Sky who would go on to develop Radio-SkyPipe, Radio Jupiter Pro and the spectrograph viewing program currently used by Jove observers worldwide. Jim Gass, one of the attendees at the original GSFC meeting, developed and maintains the Jove website and Leonard Garcia implemented and maintains the Jove Data Archive. Thanks to Len's efforts, a historic roadside marker denotes the site of the 1955 discovery of radio emissions from Jupiter. Len has also worked hard to raise public awareness with a traveling radio astronomy display, the Solar System Radio Explorer Kiosk. Chuck Higgins, another one of the Florida crew involved with program development from the beginning, is currently managing distribution of all Jove materials from Middle Tennessee State University. Wes Greenman orders receiver parts and puts the kit materials together – insuring the high quality of the Jove kit. 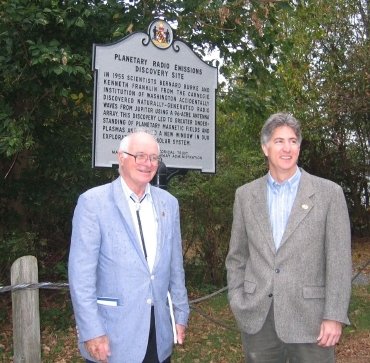 Bernard Burke, co-discoverer of Jupiter's radio emissions, and Chuck Higgins meet during the dedication ceremony of an historic marker on the 50th anniversary of the discovery near Seneca, Maryland, April 2005. Over the years the Radio Jove Project has benefited from additional funding from NASA, from the NASA Space Grant organization, and from the American Astronomical Society. The funds enabled development of hardware, software, educator lesson plans, special materials and displays for the disabled, etc. We have also received the benefit of the assistance of many summer students through funding provided by several NASA student programs. We would also like to acknowledge the kind support of the Society of Amateur Radio Astronomers (SARA) in providing funds for several individuals or groups to purchase the Radio Jove kits who otherwise could not afford them. Since the beginning, summer students have been a vital part of the program. Pictured above are some of the students who have helped (left to right): Jennifer White (now Abelow), Albie Davison, and Lili Bueno. The Director's Discretionary Fund support, that enabled the initial start-up of the project, is given to projects considered to have a high risk of failure - but also potentially very useful if success is achieved. Happily, the Radio Jove project has been one of the most successful education and outreach recipients of these funds and is now self-sustaining. Over the ten years since the first kit was distributed, we are now approaching the distribution of the 1400th kit. The kits will be found mostly in the United States, but more than a third of them have been distributed in countries all around the world. We are especially proud of the stories of inspiration from students who have won science fairs with the project, from museums and science centers that have used them to introduce their audiences to radio astronomy, and from foreign observers who could not afford the kit yet persevered in getting financial and technical assistance to reach their goal. 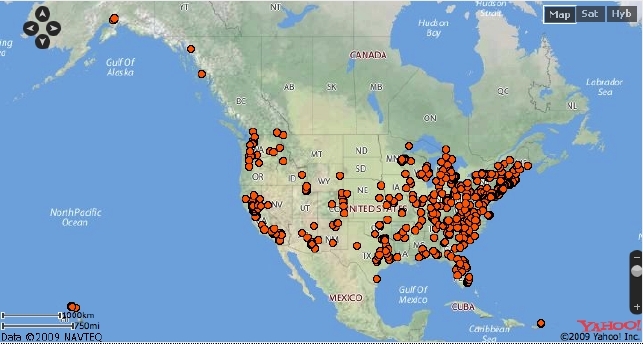 The Distribution of Radio JOVE kits in the US. About a third of our kits are now ordered from outside of the US. Map courtesy of Batchgeocode and Yahoo. We look forward in the future to working with the NASA Juno Mission to Jupiter as an education and outreach partner together with the Goldstone Apple Valley Radio Telescope (GAVRT). We will jointly provide workshops for educators involving both the use of the Radio Jove equipment and the GAVRT telescope to allow teachers and their students to experience science discovery through radio astronomy. 2009 is the "International Year of Astronomy" (IYA), celebrating the 400th anniversary of the first use of the telescope by Galileo (http://www.astronomy2009.org/general/). His discoveries changed our view of the universe forever. Join Radio JOVE in "100 Hours of Astronomy". Many events are planned worldwide for IYA and Radio JOVE will participate as well. One of these events is "100 Hours of Astronomy" taking place April 2-6, 2009 (http://www.100hoursofastronomy.org/). 100 Hours of Astronomy seeks to have as many people as possible look through a telescope as Galileo did for the first time 400 years ago. Many star parties and astronomical events are planned around the world. Radio JOVE will participate by having as many radio telescopes as possible running continuously for the 100 hours, sending out their signals on the web. However, even if you can't run continuously, we encourage you to monitor as much as possible, sharing your data with our global network of observers. Another way to participate is to take your Radio JOVE equipment to a local star party, set it up, and show others that optical astronomy is not the only way to learn about the universe beyond Earth. Although Jupiter is still close to the Sun and difficult to observe, perhaps we will get lucky and receive some solar bursts during the 100 Hours. The 100 Hours begins at 1200 UT on Thursday, April 2nd and ends at 1600 UT on Monday, April 6th. We will have a Radio JOVE coordinated observing teleconference at 1900 UT on Saturday, April 4th. Please join us and celebrate the 100 Hours. In recognition of 10 years of Radio Jove we asked some of our long time participants to send us some comments on their experiences with the project. - Ed. Congratulations Radio JOVE Project on your tenth anniversary. As an isolated observer of radio Jupiter here in New Mexico I have been greatly aided by the co-operative spirit of the group and I always appreciate the ability to ask questions and correlate data. Over the past decade I have joined in many mutual observing sessions of Io storms and I can tell you it is thrilling to be capturing Jovian radio bursts here in the mountains and see the same radio bursting in Hawaii or Florida or even France. The enthusiastic experts on the Radio JOVE email list have helped all of us tune our antennas, tighten our circuits, and calibrate our radios so that our observations are research grade. I am very thankful for all the good spirit and willing mentorship and I look forward to the next decade of penetrating the mysteries of Jupiter and its moons. I was first introduced to radio astronomy in my college astronomy classes. As part of a college field trip in the mid 70s I visited the National Radio Astronomy Observatory at Green Bank, West Virginia. I immediately fell in love with the idea of radio astronomy. At the time, it seemed impossible for a private individual to become involved with any aspect of radio astronomy. Enter Project Radio JOVE. Radio JOVE allowed me to fulfill a long held desire. Its members helped me along the way to learn and expand into other areas of radio astronomy. My sincerest gratitude to the Radio JOVE development group who have literally touched lives around the globe. Best wishes for another successful 10 years. Several things come to mind as I think about our participation in Radio Jove. The students were delighted to hear signals after they assembled the receiver many years ago. That same receiver is still serving our school faithfully. Another time the students were happily communicating with other Jove members during data collection when they started to wonder who they were talking to. When they realized they were communicating with researchers from Florida to Hawaii, they were amazed. This became an immediate teachable moment on collaboration in scientific research. My personal favorite observational moment was a large flare event. The Radio Jove group was having a coordinated Jupiter observation right at dawn. All of a sudden Wes Greenman reported a sudden boost in signal in Florida. This slowly migrated across the country as the atmosphere responded to the flare. It was a neat discussion as observers tried to figure out what was happening. When the report of the flare came in, it was somewhat anticlimactic. During the first few months of determining an optimal placement for the dipole antennas, our principal received curious emails from parents regarding the volleyball poles on the ground or on the roof. "Rod and his students are listening for aliens", were the most frequent responses to any observers of the students listening for a quiet frequency in our suburban high school. The sun wasn't very active but at least we were able to pick up a good solar burst or two on a weekly basis. We were able to set up our own space weather observatory during the first years with students gathering data from various sources and comparing decametric bursts, SIDs, and cosmic ray flux changes. It was an exciting time for research and understanding solar and atmospheric processes. Unfortunately solar activity has really diminished and has made weekly and monthly students reports difficult. But the experiments continue with a new twist. Students are seeing a side to the space weather processes that the media doesn't promote. The minimum solar cycle and lack of solar activity in the data sets help the students in arguments with the global warming fanatics even in our school. The solar cycle may have something to do with temperature variations in our planet and our CO2 emission may also alter our environment but the results are not conclusive. Students have also been successful tracking the galactic center over time. One student recently won a superior rating in the science fair with her research tracking the galactic center with the jove unit. The Project has given high school students a chance to do hands-on research and see that sometimes what you may think is "no data" can teach you a lot about our surroundings. Once there were some students who wanted to be ham radio operators. Their teacher was surprised at this. They were paticipants of the astronomy group at their school, the "Franziskanergymnasium Kreuzburg", and were accustomed to working with optical instruments to observe stars and planets. They mentioned they had heard of a project in America which makes it possible to look at Jupiter using radio waves. This was new -especially for the teacher. So soon the teacher ordered the kit - and the ball was rolling. 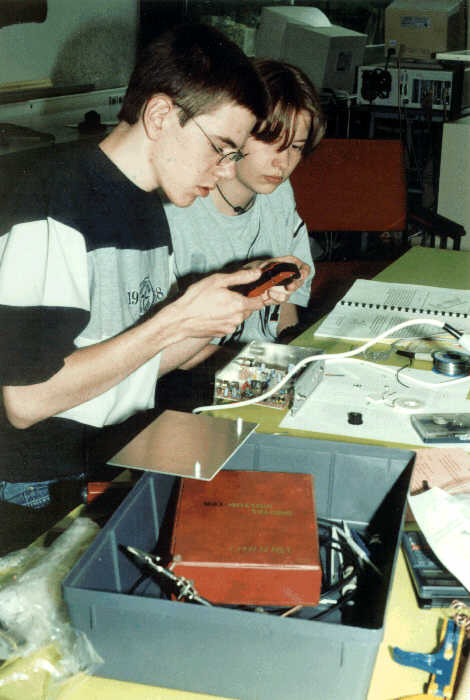 The students built the Jove receiver and mounted the antenna and activated the equipment for the first time in late 2000. Then weeks and months of searching for the sounds of Jupiter followed. But at least our group was the winner of an original RF-calibrator, so we were able to distinguish various patterns of signals. (Thanks a lot to Jim Thieman and Richard Flagg!) Supported by many other Jove participants around the world our equipment became a fixed installation and for the last few years we have been streaming our data by SkyPipe to everyone. Have a look to FGKRO ("Franziskanergymnasium Kreuzburg radio obervatory")! 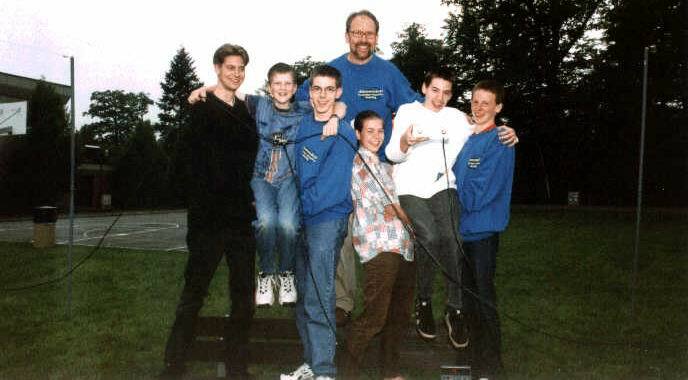 In 2003 some students paticipated in a well known competition in Germany ("Jugend forscht"). They made a presentation of the equipment and their best data with great success. They even won a prize. Another motivation for us were two visits by Jim Thieman at our school in 2003 April and 2007 October. It was a great honor for us! Over the last few years our initial success has waned due to the quiet sun and poor Jupiter apparitions. But the server is still running and we are still hoping for new clear signals from Jupiter and the sun. The team from Grosskrotzenburg celebrating the successful completion of their Radio Jove kit. Since 1997 the UF Astronomy Department (in particular Drs. Carr & Reyes and Wes Greenman) has been involved in the development of the Radio Jove program. We considered various antenna designs such as single dipoles, dual dipoles, full-wave loops and folded dipoles. The dual-dipole setup was chosen based upon performance and cost. Kit costs were researched by Dr. Higgins. The UF team has played a significant role in the development and continued operation of the Radio Jove program. 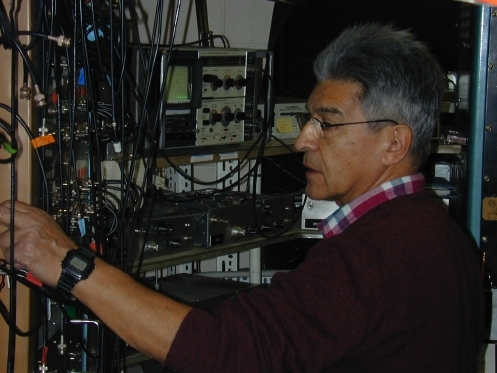 Pictured here is Francisco Reyes at the UF Radio Observatory. In 2000 a wireless radio link, funded by NASA and the UF Computing Department, was established over a 45 mile path between the UF Radio Observatory (UFRO) and the UF Campus allowing UFRO to stream real time data to Jove observers. Jove participants could now hear streaming audio from the 20.1 MHz TP Array and view a SkyPipe chart and a 5 channel, 5 frequency display of ongoing Jupiter activity. Audio was also streamed from an INSPIRE Radio VLF receiver with which observers could hear natural radio signals such as sferics, tweeks and whistlers. Appreciation goes to the late Bill Taylor of NASA and Bill Pine who provided the necessary help and INSPIRE equipment. In late 2002 Prof. Kazumasa Imai from Kochi National College of Technology provided an 8-channel KARACRIX system to the UFRO. This system allowed the transmission of 8 channels of data to Japan where it is made available to Jove observers on a server in real time. The strip-chart like display shows amplitude as a function of Universal time for both right and left channels at 18.25, 20.1 and 22.2 MHz plus the 20.1 MHz Radio Jove channel. Prof. Kazumasa Imai has supported the Radio Jove program for many years and has encouraged new observers in Japan. 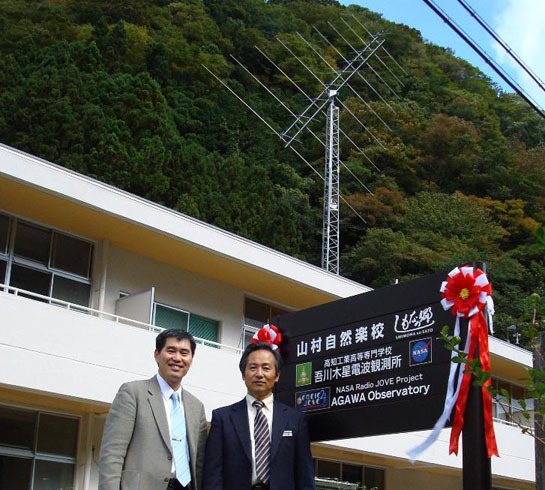 Pictured above is Kazumasa Imai (left) and Toshimitsu Ohno (right) at the dedication of the new Agawa Observatory, October 2007. In December of 2003 a spectrograph was installed in the UFRO. This spectrograph allowed observers to see the complete spectrum of Jupiter in real time over a maximum of a 10 MHz bandwidth. This was a great improvement to seeing the output of multiple narrow band receivers. You can now view in real time how Jupiter’s emission changes with frequency, clearly seeing the L-burst character and S-burst emissions. Due to radio link problems in 2007, the spectrograph is offline from UFRO. The spectrograph was moved to Radio Alachua in 2008 and has been streaming the output of the Radio Jove 2-Dipole Array over a 5 MHz bandwidth. It still shows good solar emission but the sensitivity to Jovian bursts is reduced significantly when compared to the TP array. In 2000 funding was obtained for a new radio observatory in Hawaii. This development was a collaborative venture involving Dr Joseph Ciotti of WCC and GSFC. You may be wondering why locate a Jove radio observatory in Hawaii? Geography provides the answer. When it is very early in the morning, before dawn, and observing conditions are good in Hawaii, students on the US mainland are in school and can observe data streamed from WCCRO. 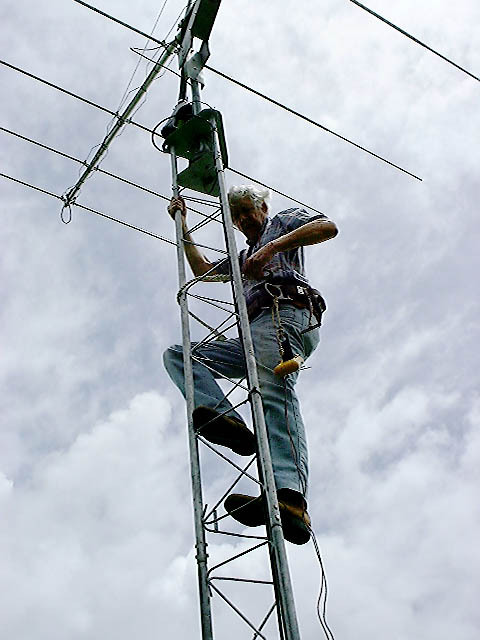 With help from Hawaii Space Grant, a log-periodic antenna was assembled and installed on a 20 ft tower with an azimuth/elevation drive system. Soon after the observatory began operation, Jim Sky and Richard Flagg began development of a radio spectrograph. This instrument streams data over the Internet and allows Jove observers to see where Jupiter emissions are occurring in the frequency range of 18-30 MHz. A second spectrograph was built for use at the University of Florida Radio Observatory (UFRO). There a large antenna array of log-spiral antennas, the TP array, produces strong signals and spectacular spectrograms. Recently the WCCRO facility moved into a modern new building where we share space with a 16” optical telescope, a heliostat, and other teaching facilities. The Radio JOVE Project was conceived in 1997 by many folks and headed by Jim Thieman at Goddard Space Flight Center. After a receiver was developed by Richard Flagg (RF Associates, LLC), The Radio JOVE Project sold its first receiver kit in April, 1999. In the last 10 years we have sold 1328 kits! Amazing! Our initial 10 kits were subsidized at a price of $50, while the regular price was $100.00. The price then, as is the current price of $190, is basically the cost of the parts of the kit. Our initial success hinged on a crucial team of folks who helped with our kit distribution. That team is our sister project called the INSPIRE Project (http://theinspireproject.org). In particular, Mr. Bill Pine and his students from Chaffey High School in Ontario, California were the original kit distribution center for the newly formed Radio JOVE Project. Bill along with his students had the foundation in place to handle kit parts, ordering, and shipping (Figure 1). 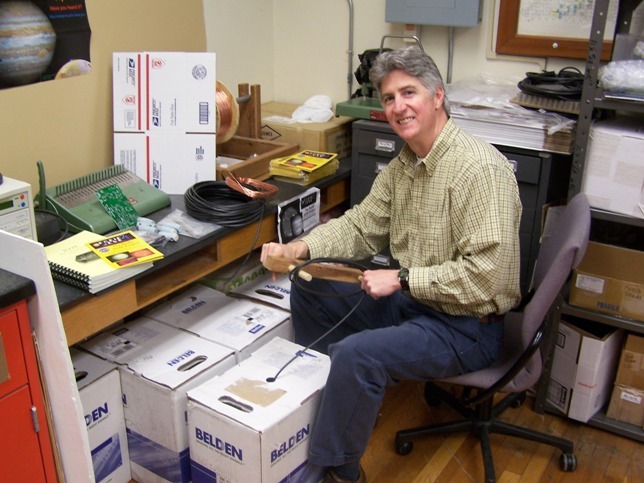 From 1999 to 2006, Bill helped Radio JOVE distribute nearly 1000 kits. He worked with Mr. John Kohus (Laboratory Services Inc. of Irving, TX) to package all the 100 parts in bags, and then was able to use his physics students to help him box up the wire, cable, insulators, and manuals for shipment. Figure 1. Bill Pine (2nd from the right) and Chaffey High school students on an INSPIRE observing run. October, 1992. In 2006 I took over the kit distribution and followed Bill Pine’s advice about getting students involved in the kit distribution (Figure 2). At this time The Radio JOVE Project Inc., a non-profit education company, was born to help handle the finances of kit sales. Wes Greenman Consulting works with me by bagging up the receiver parts bags as well as constructing the pre-built receivers. My students will add the antenna parts and box up the kits for delivery. At least a dozen MTSU undergraduate physics majors have been involved with the Radio JOVE Project. As you have seen before, our deliveries go all over the world, from Malaysia, India, Japan, and Australia all the way to England, Spain, the Czech Republic, and Russia. Figure 2. Chuck Higgins shows how to roll up coax at MTSU for a kit to be distributed. Where are those students when you need them? March 2009. In July 2007 The Radio JOVE Project celebrated the selling of our 1000th kit. We are extremely happy to still be in operation after 10 years, and we hope to continue well into the future. The Radio JOVE Project Inc. has a good partnership with MTSU; my students enjoy learning about radio astronomy, and they enjoy the team aspect of kit distribution. We hope to hear from many of you in this year 2009 in celebration of the 400th anniversary of Galileo’s use of the telescope and his discovery of the moons of Jupiter. I certainly hope that Radio JOVE can inspire a young mind to pursue science as a career and someday make the next great discovery in astronomy.